An R rated film starring a Marvel hero who perhaps isn't the most well known among the general public - and yet 2016's Deadpool found itself one of the year's most successful films, and most of us will say such an accolade doesn't go undeserved. Helmed by Ryan Reynolds' charmingly foul performance as the titular antihero, it's balance of well structured humour and epic set pieces arguably makes it one of the most original superhero films in recent times - a sequel was always inevitable considering it's profitable potential, but thankfully it's more than just a quick cash grab. The story involves the audience quite literally in a sense - a plot burdened by lazy writing (as Deadpool himself enjoys claiming) begins with the tragic death of Wilson's true love Vanessa and his befriending of rebellious mutant kid Russell (Julian Dennison) when thrown in the "Icebox" detainment unit - all this coincides with the rise of a new villain known as Cable (Josh Brolin), who journeys from the future to seek vengeance on those responsible for destroying his own. 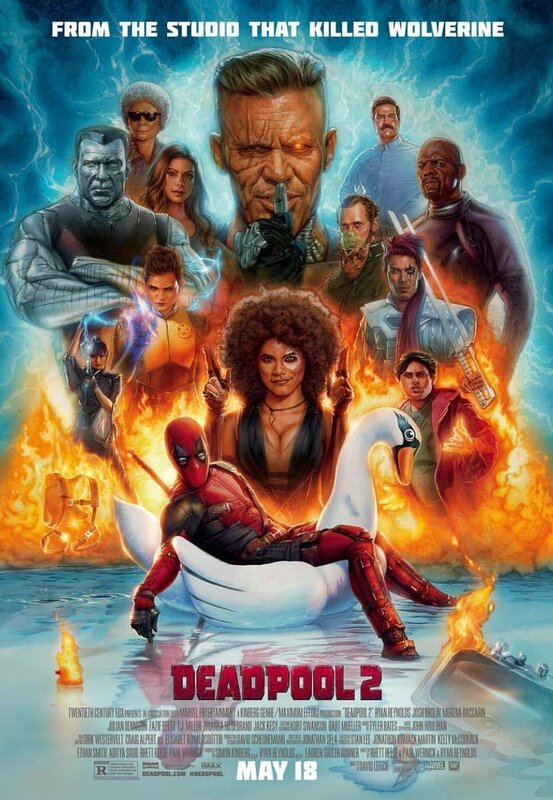 Deadpool 2 adopts the same charms as it's predecessor and in many ways improves upon them with even wittier, perfectly timed gags, from violent slapstick to a number of hilarious one liners - much of it certainly not for the faint of heart. But while it's narrative isn't without fault, mainly it's final act dragging a tad at times, there's a surprising amount of thought put into it in a way that makes this once again more than a tonnage of random giggles; many things may feel cliché, but the film embraces this in a perfect way to benefit it's sense of humour without it feeling like a forced attempt to justify, well, lazy writing. This is all blended with the right amount of gripping action sequences which, humour aside, do offer their fair share of genuine thrills providing you're able to stomach some of the incredibly graphic violence. Perhaps the films' biggest perk is once again the central performance by Reynolds himself - the rebellious badass finds himself just as loveable as he was in the original, his bitter outlook on life and it's consequential influence on his questionable acts of not quite heroism adding up to the majority of the film's biggest laughs. Perhaps the focus is largely pinned on him much more so than the many other supporting roles, but said supporting characters still mustn't go unnoticed - familiar faces like T.J. Miller and Leslie Uggams among many others support Reynolds in many of the funniest scenes, and Josh Brolin finds himself performing strongly (and hilariously) in another villainous Marvel role, despite his character feeling a little forgettable at times. If my endless waffling hasn't made it apparent yet, Deadpool 2 is a hilarious and suitably action packed superhero flick, with a strong script brought to life through a superb cast and excellent visual effects. It's not for everyone, but after seeing the original's unexpected rise to immense fame, it seems to still clicks with quite a lot of us - and rightfully so.